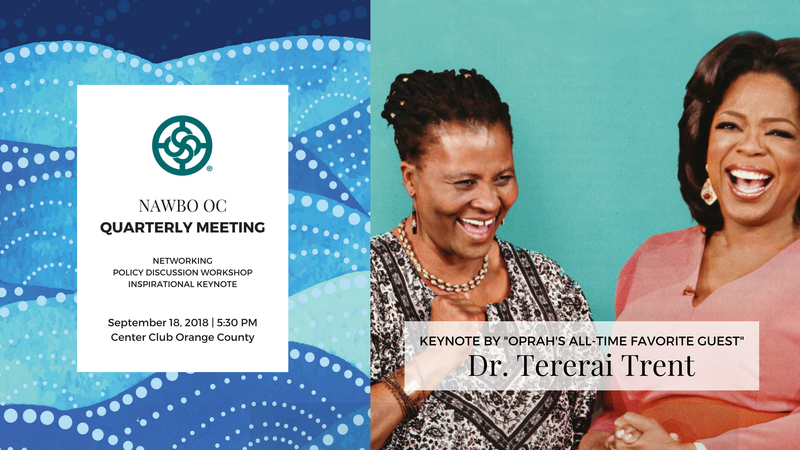 NAWBO OC Members, women entrepreneurs, and supporters of women’s entrepreneurship in Orange County, you are invited to NAWBO OC’s Quarterly Meeting to experience a lifechanging keynote address by Dr. Tererai Trent. Dr. Tererai Trent is one of today’s most internationally recognized voices for quality education and women’s empowerment. Distinguished as Oprah Winfrey’s “All-Time Favorite Guest,” Dr. Trent is a scholar, humanitarian, motivational speaker, educator, author, and founder of Tererai Trent International. NAWBO OC Members, to access your discounted tickets, please enter your NAWBO OC Member code in the PROMOTIONAL CODE area. The Member price of $45 will only appear after you have entered the code. If you didn’t have a chance to read our emails about the Member code or perhaps forgot (you’re busy, we totally get it), please feel free to reach out to us at info@nawbooc.biz or DM us on Facebook. Dr. Trent’s new book, “The Awakened Woman,” inspired the theme for NAWBO OC’s 2018-19 term, We Are Here. As we endeavor to bring more and more women entrepreneurs to the table in Orange County, we are awed by women like Dr. Trent who quite literally built their own tables. Dr. Trent speaks about dreams and the stories we tell ourselves, our communities, and the world. She guides us to reclaim our stories, re-examine our ambitions, and uncover the power in ourselves to re-create the world for the better. Please read more about Dr. Trent’s incredible journey below. Dr. Trent will be signing copies of her book, “The Awakened Woman.” We will have copies for sale at the event. The meeting will also include networking, facilitated legislative policy discussions, and orientation for new members. Space is limited, and the event is expected to sell out. Dr. Trent was born into a cattle-herding family in Zimbabwe. She was married and had three children by the time she was 18. She taught herself to read and write and dreamed of higher education in America. Her determination and belief in her dreams has earned her multiple degrees, and a prominent global platform where she advocates for universal access to education.